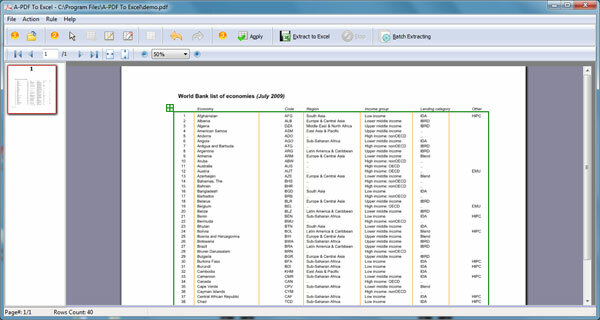 Can I extract data from PDF to CSV on Windows OS by using A-PDF to Excel? We often use PDF to record our information and then share to others. It is the king of the office software. 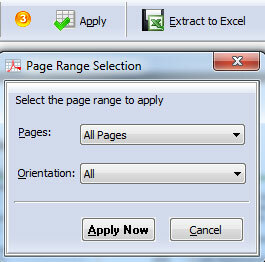 However, compare with Microsoft office Excel, PDF is lack of the capacity of analysis. Therefore, I would like to extract data from PDF to CSV on Windows OS. According to your need, you can use A-PDF to Excel tool to convert PDF into CSV or XLS format document. It will completely convert all your PDF data to CSV, even layout, so that you do not need to copy PDF data one by one. Now let us learn the below article to know how to extract data from PDF to CSV on Windows OS by using A-PDF to Excel. A-PDF Merger Command Line - A command line tool to combine image and PDF files into one PDF. A-PDF Split Command Line - A command line tool to split PDF file into separate pdf files. A-PDF Text Extractor Command line - A command line tool to convert PDF files to text.